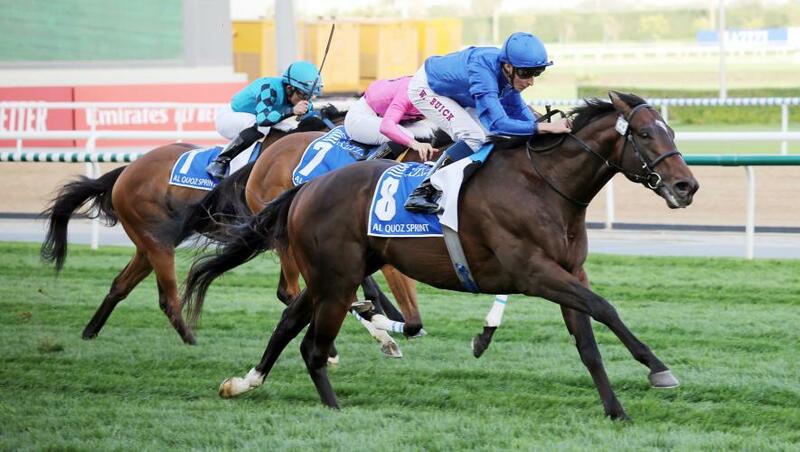 Blue Point exorcised the demons of 2018 Dubai World Cup night when storming to his second G1 victory in the Al Quoz Sprint at Meydan, UAE, on Saturday, 30 March. The five-year-old Shamardal horse, trained by Charlie Appleby, was withdrawn at the start of the six-furlong turf feature on the same card 12 months ago, but made no mistake this time when coming home a length and a quarter clear of Belvoir Boy. Blue Point, successful in the G1 King’s Stand Stakes over five furlongs at Royal Ascot in June, 2018, broke smartly and raced slightly keenly as he chased the leaders in sixth. The Godolphin star moved powerfully into the race passing the two-furlong marker and responded impressively when asked for his effort by William Buick, collaring the front-running Belvoir Boy entering the final half-furlong before being eased on the line. G1 winner Stormy Liberal finished third, another three quarters of a length in arrears, with the first three clear of the other 10 runners. His winning time of 1m 8.39s on good turf was just 0.15s outside the course record set by stable companion Jungle Cat in the G3 Nad Al Sheba Turf Sprint on Super Saturday, 2018. Charlie Appleby commented: “Blue Point taught me how to compose myself last year and he is a horse who has been close to my heart ever since he was two-year-old. “He has always been the quickest thing I have ever seen on the gallops. “He is maturing all the time and we have been very confident that we have the finished article this year. “Five or six furlongs doesn’t matter to him – he is at the top of his game in these sprinting divisions and very hard to beat. “William and Blue Point have always bonded very well. He does a lot of work on him at home and knows the horse inside out. Full credit to everyone at home, they have done a fantastic job with Blue Point. William Buick remarked: “Blue Point behaved great and has really turned a corner after his experience here last year. “He didn’t put a foot wrong in his two prep runs for this race and copied that again tonight – he had to dig a little bit deeper, but did it easily in the end. “He travelled so well and it is all about containing him over this trip. He has so much raw, natural speed and so much confidence running through his body as well.